Cheeky Fiona's personality is part of why she's captured the hearts of so many people around the world. "Fiona becoming 1,000 pounds is a big deal to us because we didn't know if she would survive in the first place," says Senior Keeper Jenna Wingate. "Starting out at 29 pounds when they're typically 50 to 100 pounds, it is a big deal that she's been gaining and increasing and becoming a regular hippo and growing as other hippo calves do." The 1,000 pound mark is more of a sentimental milestone than anything health related. The zoo notes there's nothing significant about the number health-wise, but it's certainly something her adoring public will cheer. "A thousand pounds is an exciting number and a big number and she's a third of the way to being a full-grown hippo, so that's a big deal," Wingate explains. "We didn't even know if she would survive, let alone if she would grow just as any other hippo calf does, or how large she would get. She seems to be right on track with other hippos her age and is hitting all the marks as she should." Fiona weighed it at 650 pounds nearly a year ago when she celebrated her first birthday on Jan. 24. Full-grown hippos weigh around 3,000 pounds. Wingate has been with Fiona since birth and is her primary trainer. Fiona knows many commands including how to sit, place and open her mouth when directed. Wingate says these skills make it easier for her keepers to provide care. 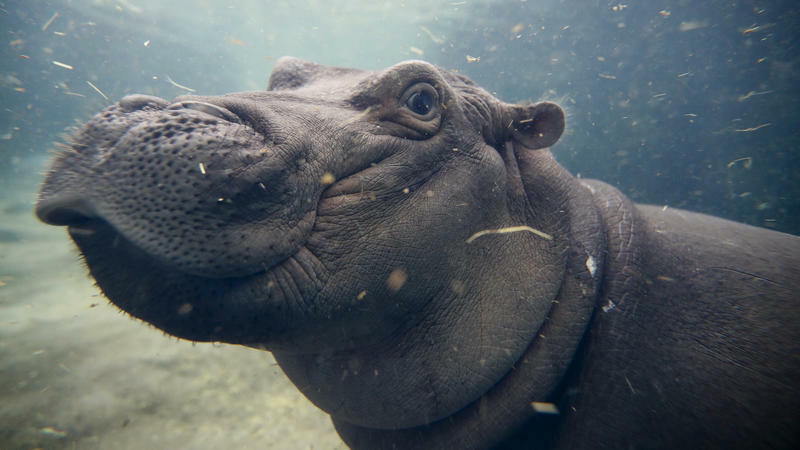 While Fiona is "just a normal hippo," Wingate says her personality hasn't changed. She still hams for the cameras and visitors, enjoys playing with her mother, Bebe, and greets her human caregivers with joy. "She's definitely living the best life," Wingate says with smile. Put away the baby shower presents - the Cincinnati Zoo reports its female polar bear, "Anana," is not pregnant.